This is a nice, appropriately noir, advert for the second edition of MARVEL UK's revival of NIGHT RAVEN: HOUSE OF CARDS. 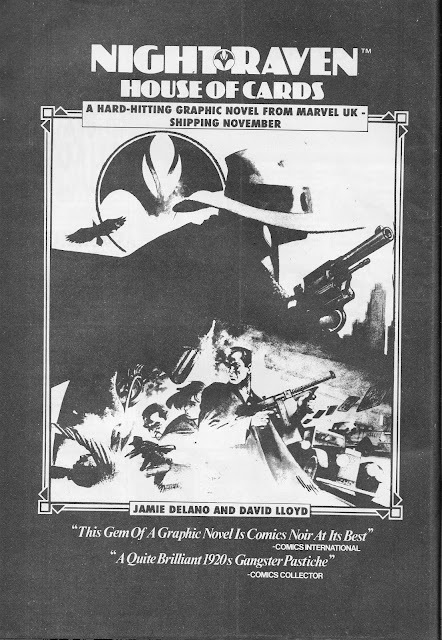 The Graphic Novel had already appeared once, with a different cover, to little fanfare a couple of years earlier (a serialised reprint in STRIP was nixed when the anthology was unexpectedly cancelled the issue before the run was due to start) but was dusted off for another edition as part of Paul Neary's attempts to exploit the (minimal) M-UK back catalogue during the GENESIS 92 era. Terrific story. Got them both, although the collected NR tales from Hulk is even better. Especially the silent story.